CPO enter the rather sparsely populated Josephs Legende lists. The other contenders for this complete edition include those from Sinopoli DG (review ~ review), Järvi Chandos (review ~ review) and Heger Acanta (review) - the latter an historic mono recording from 1952 in a single huge track. There are other recordings including that from Hiroshi Wakasugi and the Tokyo Metropolitan Symphony Orchestra on Denon, from Kurt Eichhorn and from Ivan Fischer (Channel Classics). The only one I have heard is the Sinopoli which must still sound gorgeous if you can find that long-deleted disc. From what I recall Sinopoli's violins were marginally more honeyed than those available to Solyom. That said the Staatskapelle Weimar strings are more than respectable - still closer to Beaume de Venise than to vinegar. 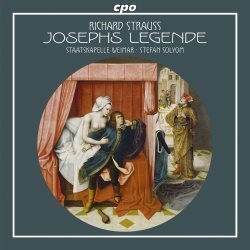 Josephs Legende is a ballet-pantomime to a scenario by Harry Graf Kessler and Hugo van Hofmannsthal. It's still far from mainstream Strauss - truly gorgeous-sounding though it is. It is luxuriously scored in the manner we know from Rosenkavalier and Don Juan. Then again what did we expect. This was written, after all, for Diaghilev's Ballets Russes. Strauss had the supercharged imagination to rise to the occasion of the lubricious goings-on in ancient times between Potiphar's wife and the holy young shepherd boy Joseph. Never fear: there's torture, attempted seduction, frustration and orgiastic dances along the way. Strauss never quite took to the ascetic and devout Joseph and this did not stop him ladling his patented and rapturously churned cream over the score. Whooping horns and gleamingly damask-heavy violins are the order of the day in trs. 1 and 6. Succulent Prokofiev-like moments are mixed in tr. 2 with suggestions of the exotic redolent of Sibelius's Belshazzar's Feast. Almost chaste pastoral moments in tr. 9 might just be a precursor to Vaughan Williams' music for Job. This arrives again but with a profanely insinuating caramel undertow in the solo violin music at tr. 18. The stately inflated baroquerie of Le bourgeois gentilhomme bruises the Rosenkavalier blooms in tr. 12. Fantasy is pushed yet further with the music-box charms of tr. 17. Waltz echoes pass like wraiths through tr. 19. After the barbaric dances of the slaves in trs. 21-22 the finale (tr.26) cannot escape a supercharged grandeur that tips over into blare and bombast. Trs. 14 (Potiphar's wife) and 16 redeem all offering some of the most tenderly romantic of Strauss moments. Straussians must not miss this. The 26 separately tracked panels play continuously but having so many access points does help greatly if you would like to get to know the score in surgeon's detail. The booklet note, which is commodiously laid out, was written by Franzpeter Messmer and Kerstin Klaholz. The only pity is that its synopsis is not keyed in to CPO's tracking scheme. Easily accessible competition comes in the shape of the Chandos disc: a hybrid SACD which I have not heard. Going by its timing that version, which comes in at 58:16, is seriously brisk but was rated highly by Rob Maynard; less so by Nick Barnard. This CPO Solyom disc is a very good sounding version of a rare colour-saturated Strauss score and is a safe and enjoyable choice.